Yes we haven’t been active this September because just like most of you, its always a busy month of the year where new school/college/university term begins, Summer just ended therefore you have to change your mindset to get back into the busy work environment, or maybe some of you are adjusting your life in a completely different place. We think we can all agree that its quite rare for most people to go on a holiday as the prime holiday seasons are usually in the Summer or over the Christmas season to celebrate the festive season in your own unique way. Having said that, one major forte about living in London is that you can always find your way in enjoying different cultures and cuisines without leaving the country. Especially after having a long day at work, we definitely want to fuel up with some great food and amazing partner or company to talk about your day. 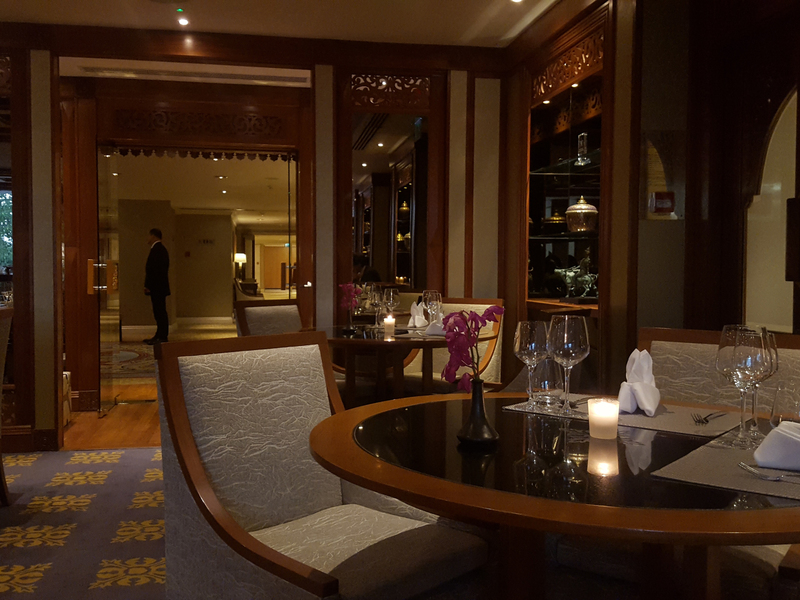 Last Thursday, instead of cooking some comfy meal in our kitchen we decided to try out some Thai cuisine at Nipa Thai London, in Lancaster Hotel (right next to Lancaster Gate Station, Central Line). Although we are quite familiar with South East Asian cuisine, we have never actually been to a Thai restaurant in London! We have heard of amazing reviews from some of our blogger colleagues who have done a review on this restaurant, and also some recommendation from our friends, so we thought, ‘Why not??’. The walk to the restaurant was quite quirky and elegant. You can already feel the excitement by its gorgeous entrance (as shown top), and once you walk into the restaurant you can smell the classic Thai aromatherapy scent that can relax your mind and body. The restaurant was not busy when we arrived around 6pm, but we can tell that there are already large tables booked for guests. If you are not too familiar with the ingredients or how the meal is cooked, you can always ask the friendly waiting staffs for more details. After ordering our tea, starters and mains, the waiting staff brought us a complementary prawn crackers, and a chicken and a prawn cakes for our pre-starters. For starters, we ordered Satay Kai, char-grilled marinated chicken on sticks (4 sticks) served with peanut sauce and cucumber relish. Not only the Satay tasted great, the presentation of the dish itself was beautiful! Our mains arrived shortly after we finished our Satay and again, not only they are appetising and flavoursome, they all had the rich aroma of spices and herbs. As we weren’t too sure about the size of their dishes, we decided to share a plate of steamed rice with coconut milk and pandan leaves (Kao Kati), fried rice with prawns (Kao Phad Koong), and chicken and aubergine Thai green coconut curry (Kaeng Kiew Warn Kai). Compared to the usual Western cuisine, South East Asians love their chilli and herbs so if you are not used to the cuisine, don’t forget to ask for a recommendation! We were quite stuffed by the time we finished our mains, however, when we saw the table next to us ordering their dessert we couldn’t resist but order them ourselves! In the end we decided to share their Maprao Delight, white chocolate mousse with infused coconut and lime and coconut sorbet. The combination of chocolate, coconut, and lime were absolutely perfect, and we would highly recommend everyone to try it for yourself. All in all we had a wonderful evening at Nipa Thai, and we would visit the restaurant very soon. To avoid any disappointment, do book your table prior to your visit either by directly contacting Nipa Thai, or book your table on Open Table website.